These are the Official Rules for the 2019 edition of the World Championship Old-time Piano Playing Contest and Festival. Some rules below have been revised, so please read them carefully. play in random order following an 8:15 a.m. draw. 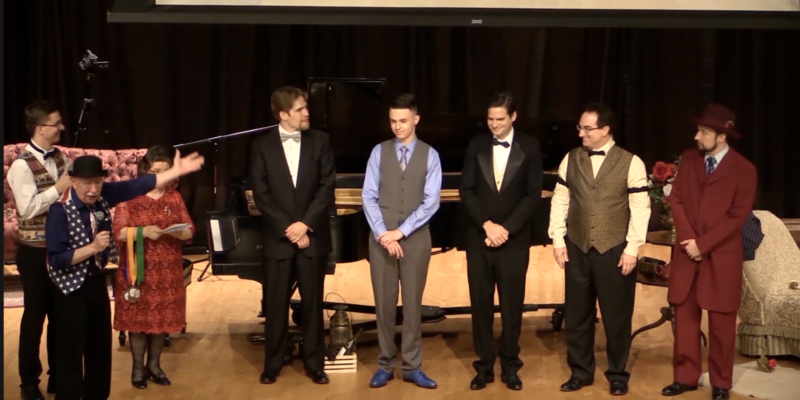 Contestants need to prepare six different selections written no later than 1939 (no medleys allowed), two of which must be ballads or standard popular songs, and not considered “Ragtime”. At no point may selections be repeated in subsequent rounds. The music must be memorized. Two selections are played in the PE’s, and each player who advances into the Semi-Finals on Sunday afternoon will play two more selections that meet contest requirements. Contestants must provide the title, composer and year written for all selections to be played on their official entry blank, and must be prepared to document a composition’s age if challenged. Contestants may change their selections up until the entry deadline of May 15 when selections must be finalized and after which date no revisions to the play list may be made. Contestants must submit a repertoire list that includes all of the selections they will play in the Preliminary, Semi-final and Final rounds not later than the registration deadline of May 15. No changes are permitted after that date. Contestants are not required to reveal repertoire for specific rounds, rather, each contestant may choose their repertoire from their “pool” list provided. Contestants advancing to the Finals mustadhere to the theme requirement. This year’s theme is “food or beverage”, and a reference to this theme must be included in the title of the selection. A contestant failing to provide their playlist by the deadline may re-enter with a late fee if space in the field permits. 7. No religious or patriotic selections are allowed, and vocal or instrumental accompaniment is prohibited. On stage, contestants need provide only the title and composer of their selections prior to their playing although additional information may be requested by the contest MC during their on-stage interview. Composer names must appear on each entry. The style of piano playing found primarily in public venues of performance between 1890 and 1939, particularly in bars and piano competitions, consisting of popular songs and instrumentals of that era, including ragtime, traditional jazz, novelty, stride, and boogie, but excluding advanced chord progressions more commonly found by 1940 or later in symphonic, modern jazz and be bop music forms. Selections may also include music idiomatic to solo piano performance and popular dance styles. 2019 THEME: Contestants who advance to the Finals on Sunday afternoon will play two (2) additional selections, one of which must contain a reference to food or beverage in the title. The food or beverage item MUST be mentioned in the title … no nuances accepted. Note that the “theme” does not apply to Junior or Senior competitors. SCORING: Point totals are cumulative. Point totals from the PE’s determine contestants for the Semi-Finals. Point totals from the Semi-Finals will be added to the point totals from the PE’s to determine the top five (5) players who then advance to the Finals, where point totals will again be combined. JUDGING CRITERIA: Judges will award points in each round based on technique, style and interpretation, showmanship and costume. In the event of a tie in points for any place, that contestant with the higher point total in technique will prevail, with the order of other tie-breaking categories to be: style and interpretation, showmanship, and costume. TIME LIMIT: For the PE’s, Semi-Finals and Finals, a total of eight (8) minutes playing time is allowed for each contestant’s performance for both tunes (not including time for audience applause, interview time with the emcee, etc.). Contestants exceeding the time limits will be penalized five (5) points for each fifteen (15) seconds or fraction thereof, of overtime. COSTUME: Costumes are required, and the judges will award points based on their old-time appearance or authenticity in the PE’s, Semi-Finals and Finals. Contestants will declare on the entry form whether their costumes are to be judged as authentic period dress (actual or replica) or theatrical performance-type, and they will be judged accordingly. CHALLENGES: Challenges to a contestant’s selection must be made within five (5) minutes after the playing of the selection has been completed. Other contestants, contest officials and judges may challenge selections for age or other reasons. In the event that a selection does not qualify after it is challenged, the person playing it will be disqualified. During the actual competitions, if a contestant is not on hand when their playing position is called, the contestant will be considered to have withdrawn from competition. Order of play for the Semi-Finals and Finals will be drawn on stage as soon as practical after completion of judging for that round, respectively. ENTRY FEE: Each entry form must be accompanied by a $60 entry fee. This is not refundable unless the contest is canceled. CONTESTANT TICKETS: The contest will provide each contestant with one (1) complimentary all-event ticket for their use plus one additional ticket for a family member or guest. These tickets do not apply to catered events or excursions. Contestants should advise when entering the contest if another ticket is needed. DEADLINE: The total number of contestants is limited to the first 30 paid entries, and each entry form shall list that contestant’s music selections, to be updated no later than May 15, the contest deadline. Entries will be accepted for up to twelve (12) Regular Division contestants; eight (8) Senior contestants and ten (10) Junior Division contestants. After the deadline, any remaining slots will be filled from the waiting list on a first-come basis without regard to Division. *It should be noted that the total number of contestants in any Division may be expanded at the discretion of the Director. ENTRY SUBMISSION: The Contest Coordinator, Faye Ballard, will answer rule and contestant questions at this address: eballard@illinois.edu. On line entries will be instantly processed and will assure your registration. Mailed entries are subject to delays, and no entry will be considered official until the appropriate fee is received, with checks made out to the University of Mississippi – May Piano Contest. 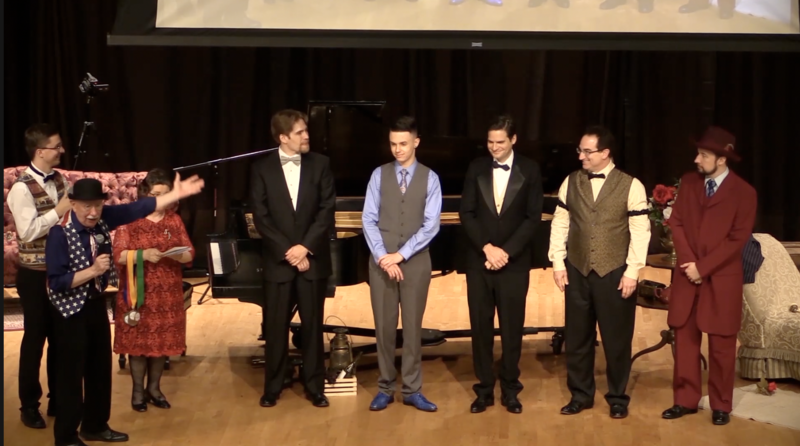 The address for mail-in entries is Old-Time Piano Contest, c/o Ian Hominick, University of Mississippi Dept. of Music, PO Box 1848, University, MS 38677-1848. Walk-on entries will be accepted on the Saturday of competition until the limit of 30 contestants has been reached or the drawing for order of play has begun, whichever comes first. A late fee of an additional $50 shall apply to entries received after the deadline of May 15, 2019. PRIZES: The winner will receive $1,500, a golden medallion and a permanent trophy. Second place will receive $1,000 and a silver medallion. Third place will receive $750 and a bronze medallion. Fourth and fifth places will be awarded cash prizes of $500 and $300 respectively, and will also receive bronze medallions. Checks will be mailed to the winners within two weeks of the conclusion of the contest (winners must be sure to complete a W-9 form on site). By competing in the contest, participants agree to allow the use of their photographs and recorded performances to promote the event. Disputes arising from the competitions or judging will be resolved by the contest judges, who will make the final decision. By entering the competition, the contestant agrees to supply his/her social security number if necessary to comply with United States tax laws. The use of alcohol or other controlled substances prior to or during competitions may result in disqualification.